Solar power has grown rapidly around the world, driven by steep cost reductions and increasing interest in carbon-free energy. In 2017, solar power was the second-largest source of new U.S. electric generating capacity, and in each of the last five years it has accounted for more than a quarter of all U.S. capacity additions. Significant strides have been made in integrating solar and other variable renewables, which introduce complexities into grid operations. While the growth of variable resources will pose reliability challenges, it will also create opportunities to explore how these resources can meet grid needs beyond merely providing energy. First Solar wanted to know what economic benefits might result if solar plants operated flexibly: if they dispatched on a sub-hourly basis and provided grid reliability services. A prior study by First Solar had shown that flexible solar was possible; to investigate its economic benefits, they hired E3. E3 began by analyzing four modes of solar plant operation. In “must-take” mode, still common today, all solar output is delivered to the grid and conventional resources serve “net load” (electricity demand minus production from non-dispatchable resources). In regions with higher solar penetrations, “curtailable” mode avoids complications from oversupply of solar. In the last two modes, which exceed current practice, grid operators dispatch solar power plants based on grid needs to help maintain reliability. This involves relying on solar plants for both sub-hourly energy balancing and real-time frequency regulation. In “downward dispatch” mode, solar plants offer these services in a downward direction only (providing “footroom”); in “full flexibility” mode, the plants may operate slightly below the available resource to provide these services in an upward direction too (“headroom”). E3 found that the greatest economic benefits result from operating solar plants in full flexibility mode, and these benefits increase as solar penetration increases. E3’s study simulated the operations of an actual utility system: Tampa Electric Company (TECO), which serves roughly 725,000 customers in West Central Florida. For this relatively small system, E3 found that must-take solar becomes infeasible when solar penetration exceeds 14 percent of annual energy supply. 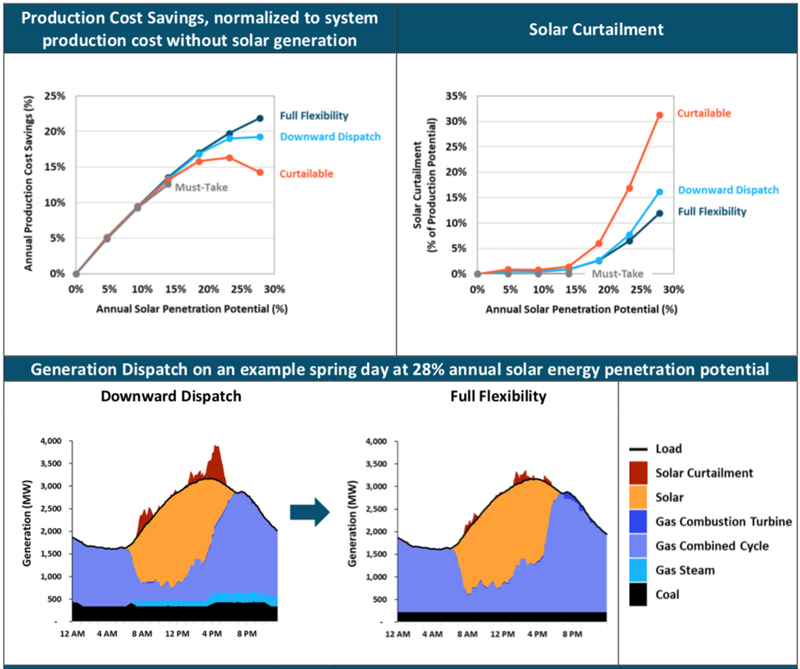 Curtailable mode enables penetration levels above 14 percent, but operating reserve costs climb as solar penetration increases. Full flexibility mode significantly reduces the need for operating reserves, which in turn reduces fuel costs, operations and maintenance costs, and air emissions. Interestingly, E3 found that operating solar flexibly – i.e., preparing to meet fluctuating power needs by curtailing small increments of solar in real time – reduces the overall amount of solar curtailment by half at solar penetration levels above 20 percent of annual energy. Flexible solar would enable grid operators to get better value out of solar plants. It would also lower renewables integration costs, since allowing solar to maintain reliability would avoid some portion of near-term investment in costlier alternatives (e.g., battery storage). While the study identifies areas for further inquiry – particularly in terms of developing better solar forecasting tools – operating solar this way does not require new technology. 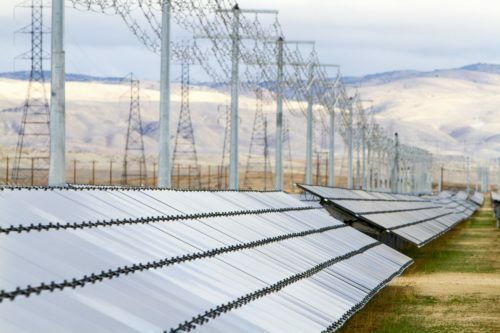 Most modern solar plants can operate with the precision needed to support grid reliability; they just haven’t been asked to. Arguably what’s needed most is a shift in thinking – not only about how resources can and should be used, but also in underlying business practices. Current contracts typically exclude solar from providing reliability services, for example, and deny revenues during curtailment. “Full Flexibility” mode maximizes production cost savings while minimizing solar curtailment. Economic benefits increase as solar penetration increases. Utilities and grid operators should stop thinking of solar as a problem to be managed, and start thinking of it as an asset to be maximized.